Want to live overseas and gain professional work experience ? LanguageCorps offers TEFL Certification Courses in 23 locations all around the world. TEFL is the acronym for Teaching English as a Foreign Language and is also the umbrella term for any course that certifies you to teach English to non-native speakers. LanguageCorps offers three types of TEFL certification programs: TEFL, TESOL and CELTA certification courses. 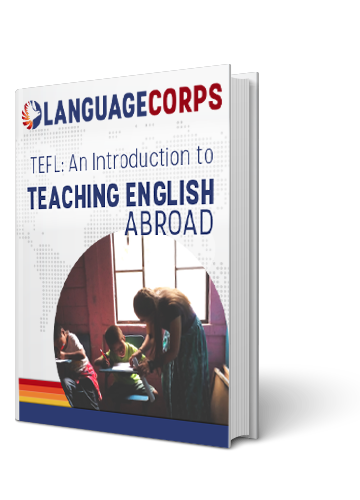 TEFL (Teaching English as a Foreign Language) and TESOL (Teaching English to Speakers of Other Languages) are often used as interchangeable terms. While they slightly differ from one another, both are established, internationally recognized standards for methodology and practice to teach English language skills to non-native English speakers. Graduates of accredited TEFL and TESOL programs are both recognized by EFL teaching schools around the world as well-trained, highly qualified English teachers. TEFL and TESOL programs are all accredited by either a university, the local Ministry of Education or an independent accrediting body in the field. It’s important to know that there is not one single organization that accredits TEFL certification programs. CELTA (Certificate in English Language Teaching to Adults) is affiliated with and accredited by Cambridge University. The CELTA course is standardized and focusses on educating adults and older teens only. Traditionally these programs are four-week, intensive, classroom-based courses in a country of your choice that range from 120 hours to 160 hours. All courses include a minimum of 6 hours of teaching practice – these are the international standards for certifying ESL teachers. Many of our training centers are located at an actual language school, so the locals you’ll teach are real ESL students from the same school. Often, the school hires teachers directly from our TEFL course. You can expect to spend full days at school, typically from Monday to Friday. The teaching practices with ESL students are sometimes performed in the evening. Apart from the input sessions at the school, you can expect to have about 2 hours of homework each day. This is usually a combination of readings and assignments. Our program in Thailand is an exception with only three weeks of in-country training. This means that the days are slightly longer and more rigorous than the 4-week courses, but the program still meets the international standards in terms of hours and training. TEFL certification courses are detailed and thorough. During the teaching certification program, you learn about ESL teaching methodologies and techniques and you hone the skills you need to be comfortable and competent in teaching English abroad. In addition to classroom instruction in effective EFL teaching principles and techniques, you will learn how to plan lessons, conduct effective classroom activities, and implement what you have learned in practice teaching sessions with local EFL students. Most people are somewhat surprised by how intense and hard-working the courses are designed to be. Throughout the TEFL course, you are supported by your TEFL Trainer who provides you with feedback, mentorship, and all the support you need to be successful. As part of the TEFL certification program, you also receive lifetime job-finding assistance to make sure you leave the program ready to start your international teaching career. Accommodations can be arranged in all locations for an additional cost. In some locations, local language training is either included, or can be arranged for a minimal charge. Please see the country pages you are interested in for specifics about the TEFL Certification in that location.